Originally published on NPR’s MindShift. Katie Hurley’s office is filled with young girls who struggle with courage, confidence and friendship skills. Hurley, a child and adolescent psychotherapist and author of the recently published “No More Mean Girls,” has noticed an escalating trend: Girls right now are overwhelmed with adult-directed activities. 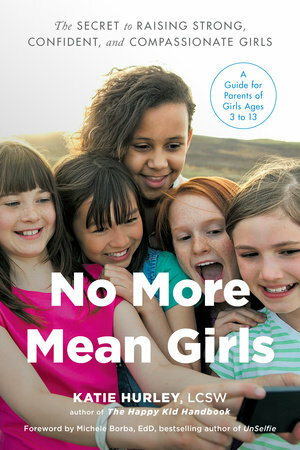 “Girls no longer have time to partake in girlhood on their own,” said Hurley. This overly structured, overly controlled milieu leaves girls feeling anxious and uncertain about their abilities to navigate basic social challenges. When girls do have limited, adult-free time with one another, said Hurley, she’s not surprised that it’s often fraught with exclusion, triangulation, fighting or avoidance. The solution to these challenges is not more adult intervention, but rather more encouragement and opportunities for girls to tackle these problems on their own. “Our need to have all the solutions as parents is very high right now,” said Hurley, and that is backfiring. When kids come to us with a problem, we tend to bounce between extremes — either dismissing their concerns as “no big deal” or jumping in to solve their problems for them. Both take less time than the alternative: guiding and supporting them as they solve their own problems. In the height of emotion — often immediately after school ends when they are tired and hungry — girls sometimes “go into survival mode and use language at home that is more traumatic than what is really happening at school.” If parents match that level of emotion, they can intensify the situation. “Once they have vented and are not so tense inside their bodies, then you can start to brainstorm together,” said Hurley. Revisit the problem when they are calm and rested, allowing them to stay in the driver’s seat. For instance, if the struggle is whom to play with at recess, encourage them to “zoom out” and reflect on the big picture, perhaps drawing a map of the playground. Where does she go? What does she like to do? What activities do other kids do at recess? What’s one thing she wants to try tomorrow? When girls think up a strategy they want to try — such as asking a new person to play and joining a new activity at recess — they also need to muster the courage to test it out. And that isn’t always easy. It starts with our language. When young girls start climbing on the playground, do the adults reflexively say, “Be careful”? As parents, said Hurley, we can deliberately communicate the message, “We take risks to practice being brave.” For some girls, risks might look like climbing a tree and, for others, it might look like saying hello to someone new. Free time in nature, on the playground, on unstructured playdates, and with open-ended play materials provides an organic classroom for girls to strengthen their courage muscles and test their ideas. Part of courage is finding one’s “brave voice,” said Hurley. Girls often confuse assertive communication with aggressive communication and then default to the other extreme: passivity. Assertive communication — including making eye contact, speaking in a clear, calm voice, and listening patiently to others — communicates self-respect and respect for the other person. Families can make a game out of teaching assertive communication skills, said Hurley. “Host little presidential debates in your home. Run for ‘Queen of the Kitchen.’ Make a speech. Have a family debate night.” When your child really wants something, ask them to write a speech and give you her best persuasive argument. “One of the best gifts parents can give their kids is the gift of their failures,” said Hurley. Tell your children stories about times you’ve tried and failed and bounced back. Our stories shape children’s understanding of how the world works. According to one study, children who hear stories about how family members and ancestors overcame obstacles are more resilient in the face of challenges.